You’ve probably heard that God answers our prayers with “Yes,” “No,” or “Wait.” But did you know that your very first prayer of forgiveness establishes a relationship with the King of the Universe Himself? Continuing prayer, or simply talking with God, maintains that relationship with Him. When we ask according to our needs (not wants), God answers according to His plan and purpose for our lives and His will and perfect timing in any given situation. “Yes” answers come immediately. That means that whatever we’ve asked for fits within God’s plan and timing for us. “No” and “Wait” answers require some seeking and knocking on our part. Jesus told His disciples, “So I say to you: Ask and it will be given to you; seek and you will find; knock and the door will be opened to you. For everyone who asks receives; the one who seeks finds; and to the one who knocks, the door will be opened,” (Luke 11:9-10). Did you notice that God’s commands to ask, seek, and knock are all followed by His promises? It will be given to you when you ask. The door will be opened to you when you knock. In other words, if you do what He tells you to do, He’ll come through for you. That’s a promise. 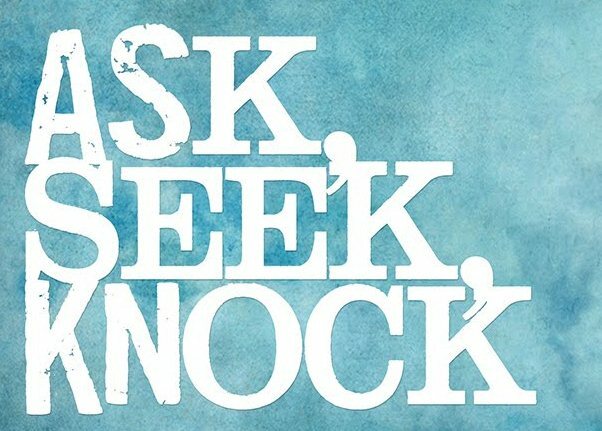 Ask, seek, and knock represent three different levels of prayer, all of which arise out of a need. ASK prayers are verbal requests that will be met immediately with a “Yes.” All you have to do is ask. For instance when we ask for one of God’s attributes like wisdom, we will have access to His wisdom immediately. You see prayer is a two-way street. When we ask, God answers based on our trust in Him. We prove our trust by putting His shared wisdom into action. Here’s an example: As I was multi-tasking in the kitchen, my back was turned to the wok of oil heating on the stove behind me. When I felt heat on my back, I turned around to discover the oil on fire with flames leaping three feet high and toasting the cabinet above the stove. Quick as a flash, the answer came to me, “Stick it in the oven! I grabbed a hot pad, wrapped it around the handle, flung open the oven door, stuck the fiery wok in and shut the door. No fuss. No mess. It was a solution I’d never thought about before. But I asked, trusted, received and acted on God’s wise answer and lived to tell about it. God sits on ready to supply all our needs. So ask believing, and you will receive. Love this! Once again, I needed a reminder!